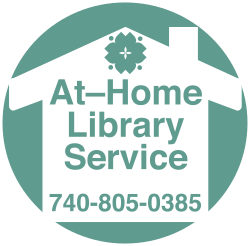 Do you know an Athens County resident who’s unable to visit a library branch due to illness, disability, caregiver responsibilities, or an ongoing lack of transportation? Deliveries will occur at least once per month, and patrons can either request their own items, or have items chosen for them by library staff, based on things like the patron’s favorite authors and genres. Equipment for patrons to check their own blood pressure will also be an optional part of at-home visits. Applications are available at all seven ACPL branches or by contacting Laura O’Neil at home@myacpl.org or (740) 805-0385.